Researchers from the laboratory of Matt Grubb from the Centre for Developmental Neurobiology at King's College London have shown that the form and function of dopaminergic cells in the olfactory bulb depend crucially on when those cells are born. The study was predominantly funded by a Wellcome Trust Sir Henry Wellcome Fellowship to Elisa Galliano and partially pursued in the laboratory of Venki Murthy at Harvard University. The findings are published in the journal eLife. Dopaminergic neurons constitute only a minority of brain cells, but can have a strong impact on physiological and pathological behaviours. In the olfactory bulb, the first part of the brain to process smell stimuli, dopaminergic cells are local interneurons that act as a dimmer switch to control the amount of information transferred from the nose to the central nervous system. Besides playing this key role in the processing of smells they have other special properties, including being one of the very few neuronal groups that can be generated both embryonically and postnatally. However, to date no functional properties have been linked to their time of birth. In this study, the authors asked whether there were physiological differences between embryonically- and postnatally-generated dopaminergic neurons and if so whether these would affect their functions. They found that the two dopaminergic subgroups with different developmental profiles can be differentiated by the presence or absence of a key subcellular specialisation: the axon initial segment. This is the region of the neuron where action potentials are initiated and that delimits the cellular process called the “axon”. The authors discovered that while embryonically born olfactory bulb dopaminergic neurons possess an axon, all of the postnatally-generated olfactory bulb dopaminergic cells are completely axon-free. Furthermore, the axon-bearing cells are morphologically different, have different electrical properties to their axon-less cousins, and also show some subtle differences in their ability to respond to odour stimuli. Two very different types of olfactory bulb dopaminergic cell are therefore produced at different stages of mammalian development. 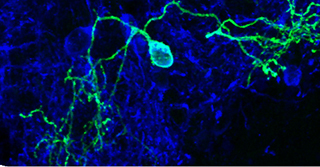 Elisa Galliano, first author on the study commented “Looking under the microscope and seeing individual dopaminergic neurons labelled with fluorescent markers emerge, brightly lit with their beautiful and diverse arborisations, and discovering that shape matched both function and birthday has been a real treat”. Matt Grubb, senior author on the study said “It was fantastic to see, in vivo, the same distinct types of dopaminergic cell that we’d previously identified in cell culture. To then discover their completely different developmental origins was just a massive exciting bonus”. These findings strongly constrain the potential role of adult-born dopaminergic neurons in olfactory processing and future studies will need to identify how these different subclasses of neurons impact on olfactory behaviour.